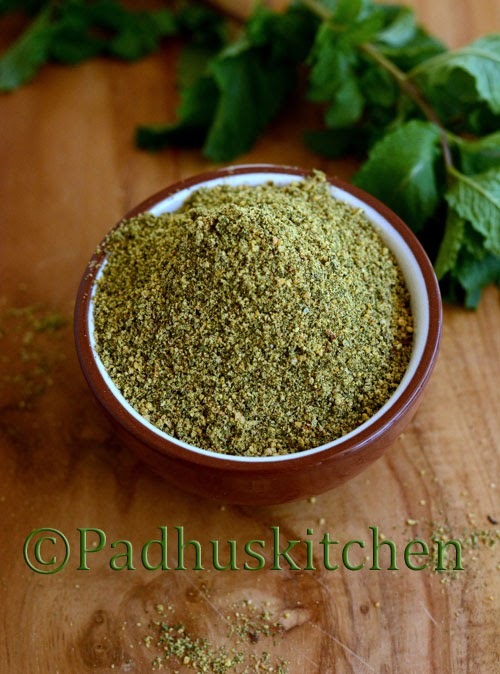 Mint Podi/Pudina podi is a very flavorful podi which goes well with rice and idli, dosa. This podi when mixed with piping hot rice and ghee tastes awesome. I used homegrown mint to make this podi, so it is all the more aromatic. Today we will learn how to make pudina/mint podi following this easy recipe with step wise pictures. Wash the mint leaves well, drain the water completely and pat it with a towel. Spread it on a cloth and leave it to dry in the shade. There should be no moisture in the leaves. It should be completely dry. I got 1 1/4 cup of dry mint leaves. You can plant the thick stem and get fresh mint at home whenever you need. Learn how to grow mint at home easily. Heat oil and fry urad dal, channa dal (kadalai paruppu), red chillies, hing and tamarind (if using). Once dal changes golden brown, remove from heat and transfer to a plate. In the same pan, dry roast cumin seeds and peppercorns until you get the aroma of cumin seeds. Dry roast mint leaves on low heat, when you crush the leaves, it should break. That is the right stage. Dry grind the lentils/dal + red chilles, cumin seeds + peppercorns with salt to a coarse powder. Then add the mint leaves to the coarsely ground powder and grind it again. The powder should be slightly coarse and not fine. Flavorful Mint/pudhina podi is ready. Enjoy eating it with hot rice and ghee or with idli and dosa. Check out more Podi recipes. They come handy when you do not find time to cook. If you found this post useful, I would really love it, if you pin it or share it with your Facebook fans or Twitter followers or Google+ circles or Instagram today. All it takes is a simple click on the “pin it” “like,” “share,” “tweet,” or Google+ buttons below the post. I would love to hear from you, please feel free to share your feedback with photos to padhusblog@gmail.com or in Padhuskitchen facebook page. Thank you!